John Meechan is to call : probably for his Last Contra. Great music: It's Elaine & Brian: Portland Drive Duo. Near M42 J5 From 1.30, inclusive hot Drinks. Large, enclosed car park. lively Brummie contras: B91 2SF - ELMDON HeaTH Community centre HALL : NEAR J5 M42. click here : map & public transport. Ask For £2.50 off when you 1st visit our contras. 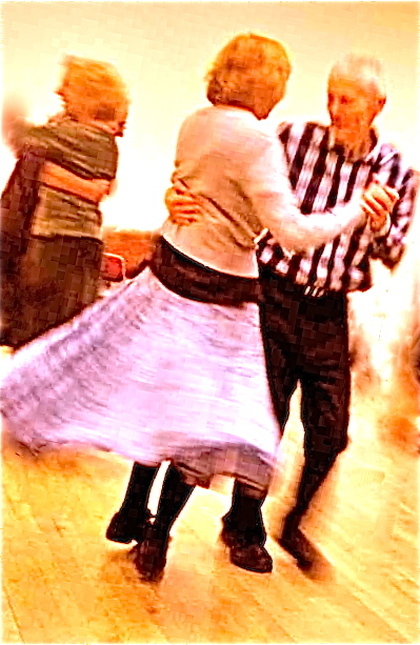 you're at the page ABOUT BRUMMIE CONTRA DANCES held at Elmdon Heath Hall. - ​ New to the Contras at B91 2SF ? ASK for £2.50 off at the door. - You may EACH claim a discount of £2.50 at the door. - Always - especially in winter - check Website home page Sun at 10am ! Relax after travelling. Inclusive hot drink & biscuits from 1.30pm. THEN 3 HOURS of FUN & LIVELY DANCI﻿﻿NG, with more inclusive refreshments. Prefer a more gentle afternoon? Relax at the tables. Enjoy the music without always being pulled in to dance. Celebration afternoons have a brief early extra bubbly/eats break. 1) Details to generally recognise / locate the Hall - Bus routes in Birmingham - see main VENUE page ! DOES THIS HELP YOU GET THERE ? new X12 route every 30 min to the Hall door, (& to across road directly opposite) ! 2) For car - for cycling - to walk - for destination bus stops - see & download for smartphone, or to print on MAPS page ! 4) RAIL to﻿ BIRMINGHAM INTERNATIONAL STATION ﻿page. Each 30min, direct X12 bus stops. CHECK details. NOT a nice walk ! Always welcomed are any kind donations of prizes for the raffle which Les so helpfully organises for the dances. The Brimmie C's need you keen contra dancers regularly to share lively Sunday afternoons: So please come AND bring your friends ! especially from a man's viewpoint. has enabled many lively Brummie Contras - now entering their 4th year. A door price is needed which brings fair recompense to lively contra-playing musicians. Callers / players from USA. £1 more is requested at the door, to assist with their travel. 10 ( of 11 requested ) dates for bands & callers were provided at Elmdon Heath in 2017. 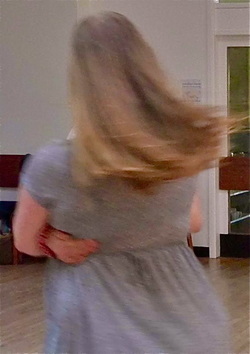 Our Good Friday 3rd Anniversary Dance was at the Friends' Meeting House in Bournville. The Elmdon Heath Hall is regretfully required to be left empty for this, our Dance Anniversary. The Bournville Quaker Hall helpfully was organised for this by Barry Selwood, prior to his untimely death: January 2017. At Bournville, more popular with B'ham dancers, we receive ( thanks to Barry ) a hall pricing for regular bookers. In 2018, we are booked to dance at Bournville on Good Friday 30 March & Sat 10th November evenings. Elmdon Heath's closeness to M42 J5 makes it popular with our regulars who travel a distance. It would appear less so with many rail travellers, many younger dancers, and many resident in Birmingham. - The Brummie C's need YOU to be keen dancers: Regularly sharing lively Sunday afternoons: Please come AND bring your friends ! WITH A PLE﻿ASI﻿NG VARIETY OF DIFFERENT DANCING PARTNERS. And many thanks for the understanding & adaptation of dancers, allowing Annie to somewhat dance again with us after her stroke. Thanks for respecting all occasions when someone enjoys the company & music, but dances less, or at their own more gentle pace. Why on Sunday afternoons ? Easier journey: Time for tea/coffee before the dance - Fewer regular activity clashes.